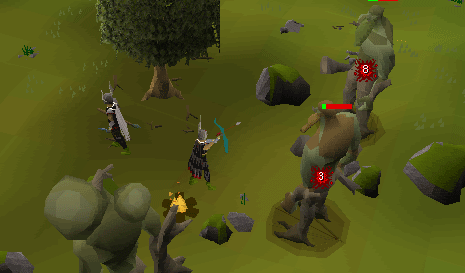 Ranging, as one of the three combat styles in Runescape, has one big advantage over the 'normal' melee style of combat (as does magic): the ability to hit your target from a long way off, without you getting hit in the process. 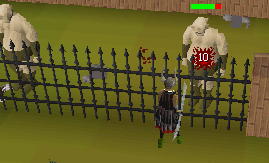 Whether you want to fight the various monsters in RS, or go out and engage in PKing, you would need a decent range level to be effective. The aim is to help you on your way to becoming this decent, or even very good ranger. Beware though that everything you read below is only an advice: There are different ways to gain xp fast, and the only 'right' way is the one that you feel comfortable with. When ranging you want to fight monsters with a low Defence to ranged attacks, and there are plenty of those about. But you should now decide if your aim is to level your range capability, or if you want a combination of money making and leveling range. As we go along in this guide we will point out what the fastest way is to xp but also take a look at the combination of xp and loot. 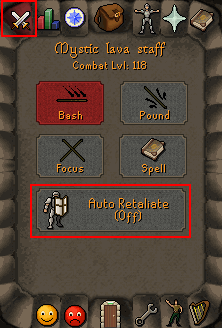 For the whole of this guide there is one setting in your combat screen you should be aware of: The fastest way to xp is the rapid setting. And this holds true for all types of weapons. When ranging it is possible to raise your Defence level as well: You need to switch your attack style to long range to do so. This would mean the number of monsters to kill would double, as the xp gain is divided over both range and Defence: 2 points toward each skill. Strength and attack can not be raised ranging. Within this guide we will also look at some of the Members ranged weapons that are effective when raising your range level, though we will limit them to: Knives, Crystal Bow and the Dwarf Cannon. We also have some information on the latest addition: The Rune Crossbow. Beware: This guide supposes you have Defence level 1 and can use only leather as armor when you start out, should you have a Defence level higher go for the best available armor. This not only gives you better protection but also gives a higher range bonus. Though the guide is more or less split between F2p and Members it should be obvious that all comments pertaining to F2p are useable in Members. What is more: Exactly those spots are the least crowded at times in P2p. We will not describe training spots located in the Wilderness. 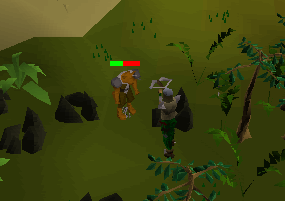 Due to the inherent dangers of getting Pk-ed, the Wilderness isn't a very good place to train. Both in Free-play and in Members worlds these are the hardest levels to get: You start out hitting low and not very often, you can only use limited types of arrows, bows and armor. In general you can say: 'The fastest way to level is to use the best bow, arrow and armor possible'. So, wield your Shortbow and some iron arrows, Leather boots, vambraces, chaps and body (or Hard leather body if you have a Defence level of 10), should you have it also wield an Amulet of Power or Amulet of Glory and let us look for some targets. 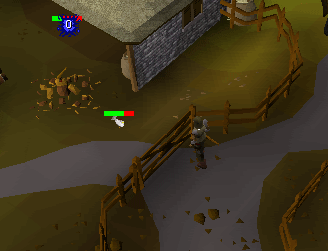 When attacking Cows, stand on one side of the fence and click to attack them over the fence. Preferably stand close to the gate so you can run in to retrieve your arrows: The money drain while leveling will be a bit less, as you can retrieve around 75% of the arrows used. Should you decide to opt for some money in the process: Stick to chickens until you are level 20, collect the feathers, and sell those up to 10 coins each. This way you need not go to a bank, and can keep on ranging. Should you decide on this go into the area with chickens, and range them: Chickens tend to flee when down to their last 10 Life Points when ranging them. 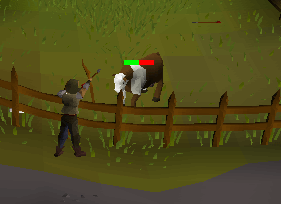 Cows have more Life Points but also a higher range Defence so they will take more arrows to kill. Banking cow hides is more profitable, but it also takes more time. Both Freeplayers and Members have access to a bank on the top floor of Lumbridge Castle. 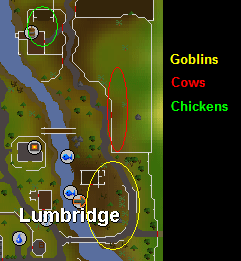 For Members there is a bank even closer in the basement of Lumbridge Castle but to access it you need to finish two parts of Recipe for Disaster. To reach level 5 you need to kill 33 chickens or 13 cows. The step with the Oak Shortbow to level 10 needs another 64 chickens or 24 cows. Reaching level 10 would cost around 100 iron arrows (when picking up arrows). From level 10 the maximum hit with an Oak Shortbow is 3 with steel arrows. If you can afford it start using them: it is an increase of maximum hit over iron arrows of 50%. Once you reach level 12 switch back to iron: Your max hit will then be 30 Life Points with them as well. 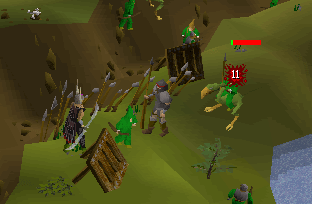 If we stay at Lumbridge a more interesting monster is available: Goblins. Walk south from where you were and find the fence you can hide behind, and merrily start ranging away at them. One type available here: level 2 with 50 Life Points. An alternative to them are Giant Rats. 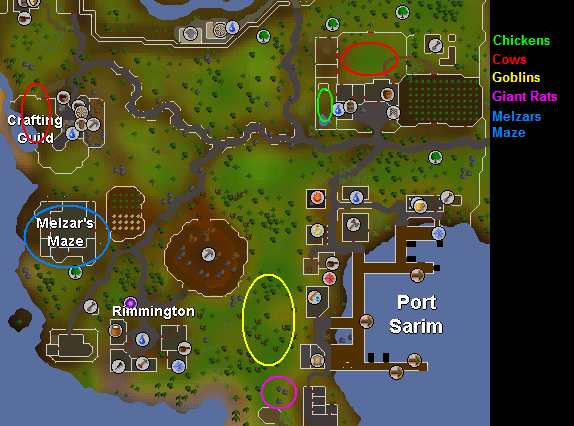 West of Port Sarim jail is a spot where you can safely range them without getting hit. At this spot you can also have a go at the Goblins walking around. Should you have started Dragon Slayer you can use the Giant Rats on the ground floor of Melzar's Maze. If you are looking for loot stick with Goblins, they do drop a fair amount of runes, money and bolts (and for Members: the rare Champion Scroll). The bolts you can use should you decide to finish Dragon Slayer Quest as a ranger. The crossbow, next to knives and darts in Members, is a one-handed weapon which lets you use an Anti Fire Breath Shield. Members have a few alternatives, from level 10 up, to these three if you look at fast xp: Crawling Hands. 2 different types level 8 and level 12 with respectively 16 and 19 hp. Beware though: You need level 5 Slayer to engage these. They could also be a nice money maker: They can drop Mystic Gloves, Half Keys and up to ruby Rings. If you are very lucky you might even get a Left Half Shield. Minotaur would be your choice for fast xp: Very low range Defence. If you started with all stats at 1 you will now have range 20 and 150 Life Points. It will have taken about 300 iron arrows to reach this goal (if you picked up all the arrows on the floor that is). Time to switch bows again; This time to the Willow Shortbow. Life is getting more interesting now as a ranger: More monsters to choose from, better loot if you are seeking that, and slowly more equipment becomes available. Time to put on your Coif and Studded chaps and, if you have a Defence level 20 or above wield the Studded body. If you have a Defence level less than 10 keep the Leather body, and between 10 and 20 use the Hard leather body. Members: Change armor to Snake Skin (if you have 30 Defence) and bow to Maple Shortbow. Complete the Animal Magnetism quest and equip Ava's Accumulator - this item will automatically collect your arrows for you. F2p and Members: Change armor to Green Dragon Hide. If your Defence is lower than 40 keep the leather body, Hard Leather body or Studded body. If not and you have finished Dragon Slayer put on the Green Dragon Hide body as well. 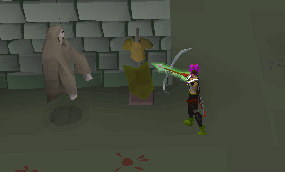 Members: Change bow to Yew Shortbow. Keep both the Snake Skin bandana and boots as they give a range bonus (total +7) unless you are the owner of a ranger set , in that case switch to those as the bonus (total +16) is higher. For the Robin Hood hat there is a less costly alternative: Fremennik Archer Helm which gives +6 range bonus (2 less than Robin Hood hat), though you need to have finished Fremennik Trials for it. Members also have an alternative armor when they have finished Fremennik Trials: Both the chaps and body of Spined armor have the same stats as Green D-hide. 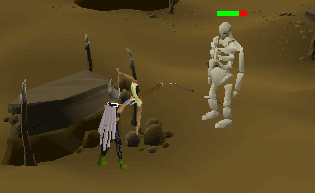 In general you now could range any monster whose combat level is about up to 5 levels above your range level (when using iron arrows/knives), provided you can find a safe spot. If you can't find a safe spot your ability to range them depends on your Defence level: You range as if you were fighting melee. The key moment to switch to the next higher level monster is when other people can't see your arrows after killing it. This tactic saves a lot of arrows, and gives an indication you are making the most of them. All these spots have lots of objects to hide behind. 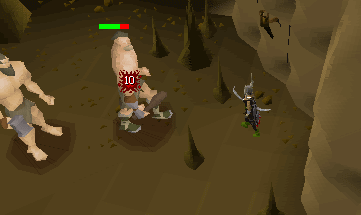 If you want a combination of fast xp and money: Hill Giants. Low range Defence, drop Big Bones and Limpwurt roots which can be sold for a decent amount of money, but only try these if your combat level is 28 or above, or if you use magic as the first attack. Higher leveled players will beat you to them close to every time if you don't. 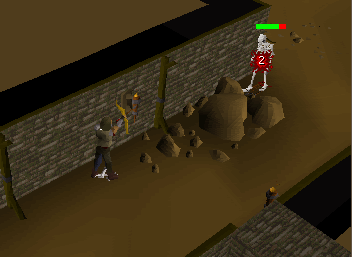 Faster xp are the level 21 Skeletons at the entrance to Edgeville Dungeon; hide behind the rocks there and just start puncturing them. Up to level 40 range the Skeletons are faster xp than Hill Giants. One of the big advantages of this spot: Hardly anyone uses it, the only ones attacking the Skeletons are the people going deeper into the dungeon. 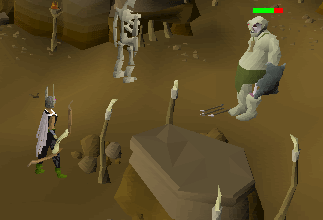 What is more: Below level 30 range people can't steal your arrows, whereas at Hill Giants people can. Once again the benefits of a members account are obvious: Both better monsters to choose from, more locations to find them, and even the same monsters have better drops. The Skeletons mentioned earlier, drop herbs which you could sell unidentified for up to 1k each. For fast xp there are various monsters to choose from. If you did follow the guide up to this point you will have spent around 1500 iron arrows and arrived at level 40 ranged. Sad but true, the next 20 levels are going to be a bit boring. This intermediate step doesn't change much from the last one. One of the reasons is because we are looking at fast xp: Hill Giants and those pesky Skeletons from the last episode become faster still. Members: Switch to Blue D-hide armor. Switch to Magic Shortbow. Members: Switch to Red D-hide armor. Also switch to the Dark Bow. From level 40 ranged it is time to say good-bye to your trusted iron arrows and switch to either steel, or mithril (or even adamant if you can afford it). Though there are certain cut-off points where the next best arrow equals the lower arrow in maximum hit, it saves time and an inventory spot if you stick to one type of arrow. I wouldn't recommend switching to higher knives: They are hard to come by, extremely expensive when buying in large quantities (if at all available), and do not hit high enough to warrant the switch. 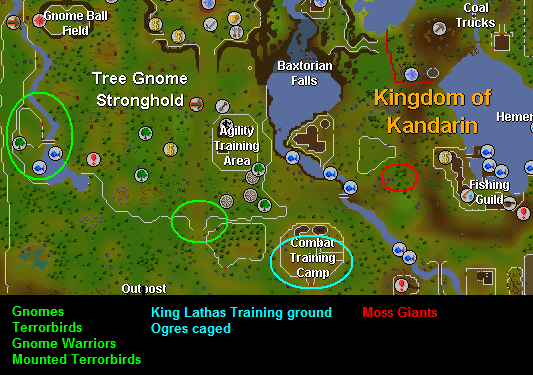 Moss Giants in F2p can be found in two, more or less, accessible places: Varrock sewers and on Crandor Island. Crandor is the best option to range, but it needs Dragon Slayer to gain access to it. Members, once again, do have a big advantage: two very good spots around. Close to the Fishing Guild and on an island west of Brimhaven. 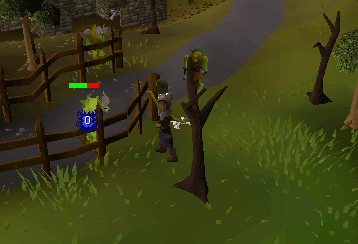 At around level 55 ranged, Moss Giants become pretty fast xp if counted per hour played. What is more: they do have some decent drops, up to D-spear in Members. 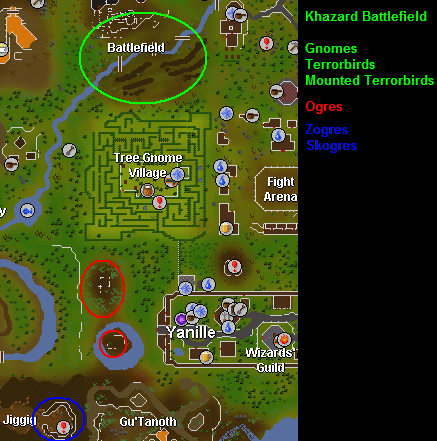 Hobgoblins can be found in many places in Members, but only in a few spots in F2p (from a rangers point of view that is). Once again Crandor Island for F2p. 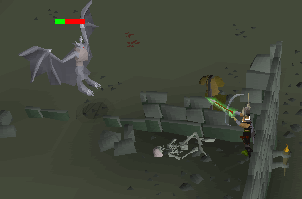 Pyrefiend is once again a Slayer monster, but needs no special equipment. A few good range spots about, and your D-hide is perfect Defence against their magic based, melee attack. They can drop level 2 Clue Scrolls, a lot of fire runes, gold ore and steel boots. Level 30 Slayer is needed. You are now on your last stretch to become a decent ranger. At level 75 you can range close to all monsters in RS, without having too much to worry about losing arrows. You also have access to the best equipment available during the quest to reach 75: The Crystal Bow and Karil's X-bow, but these two are not better than a Magic Shortbow with adamant arrows until you reach 75. Members: Switch to Black D-hide armor. Members: Switch to Crystal Bow. Though most of the list above is NOT the way to fast xp, most rangers switch to these when reaching level 55. I wouldn't recommend doing that. The fastest way forward still are those lowly Hill Giants, Skeletons and the like. F2p players, from now on, are limited to Lesser Demons as the most suited monster available, and they should switch to them from about level 65. Two very good locations: Under Karamja Volcano and on Crandor Island. Below level 65 Lesser Demons are not really an option for fast xp. There is one higher leveled monster available which has a low enough range Defence level: Ankou in the Security Stronghold Dungeon. There are a few good safe-spots about but they do attack you on sight, so be sure to bring some food. F2p players should switch to Ankou at around level 75. One decent way to level reasonably fast are the Ogre family: Ogre, Zogre, Skogre and Jogre. King Lathas has provided the ranger with a few caged Ogres at the Combat Training Camp, and this is a good way forward but it can get crowded at times. 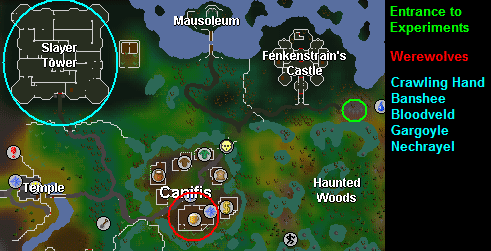 Another good spot is close to Yanille. Zogres and Skogres only become available after finishing Zogre Flesh Eaters quest and you should be at least combat level 96 to attack them without a worry: They can give you the 'Orange Disease', slowly dropping all your stats, except hp, to zero. Antidote is Relicym's Balm, which you can either make, or buy from Uglug Nar (you need to sell one TO him before you can buy them FROM him after finishing the quest). Zogres and Skogres drop 100% Zogre bones and a Coffin key. Use the key to open a coffin and you could get one of the Ancient Bones. 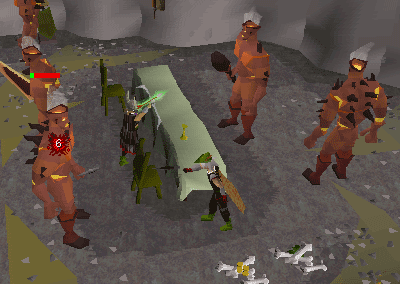 Wield an Ogre Composite bow with Brutal Arrows to fight Zogres and Skogres. 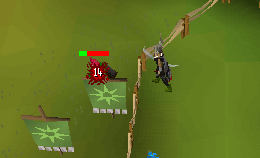 Once you reach 60 ranged there is one outstanding way to fast xp if you are a Member and have 50 Slayer: Bloodveld. Though he does drop items up to rune med, and up to 30 Blood runes, you cannot call him a good way to money. XP however, is a different story: 1,200 Life Points, very low range Defence, and five safe-spots around. Were you to stay with this prey, and do nothing else, you would level faster than with any other monster around. At 99 range a Crystal Bow will make minced meat out of around 190 of them or, in xp terms: a staggering 90k per bow used. 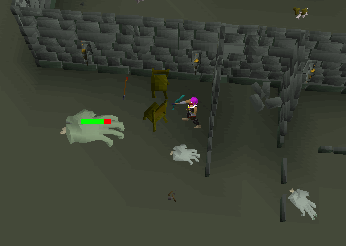 Turoth at the Fremennik Slayer Dungeon, 2 good range spots there. 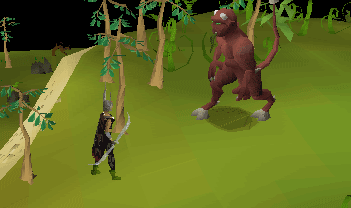 Probably the all-time favorite monster to range in RuneScape is the Fire Giant. Readily available in two rooms at the Waterfall Dungeon (you need Waterfall Quest to enter). Though opinions vary, I found the Melee room to be the best room for ranging as well: 7 Giants available, as opposed to 3 in the west room. Once they stop auto-attacking, you can hide behind the table and the chairs there. On entering this room stick to the eastern side of the double door. That will be your safe-spot until they stop attacking you. If you have low Defence be sure to bring some food: They can hit up to 120 Life Points. XP-wise these are pretty good prey from level 70 range and up. 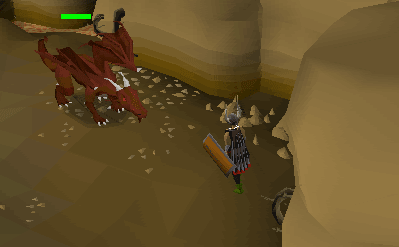 Below that you can have a go because they drop Dragon items, like the D-spear and D-med, and rune items like Square, Scimitar, 2-Hander and Kite. A few safe spots in the melee room of Waterfall Dungeon. Looking at your level you now have 75% of your quest to 99 ranged complete, and you can call yourself an experienced ranger. Xp wise however, it is a different story: 10% done. That can be a bit depressing and in all honesty: It will be at some point. You now might want to try your luck at some exotic creatures. By all means go back to fast leveling as described above: Your targets won't change during this stretch. 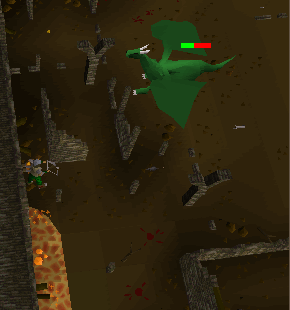 Bloodveld still are the best range xp, Fire Giants still stay popular and give decent xp. But you might want to try your hand at Blue Dragons: reasonable xp and reasonable drops. Red Dragons in Brimhaven Dungeon are the only source of red hides outside the Wild, and full Red D-hide can bring a pretty penny. 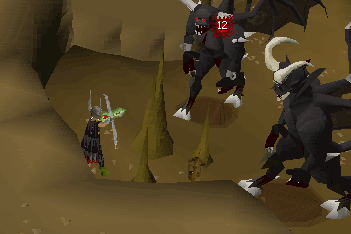 Black Dragons and Black Demons, both at Taverley Dungeon, are pretty safe to range. But again: Not for xp. One of the relative new monsters, Suqah at level 111 is a decent way to xp. 1,070 Life Points is the same as a Blue Dragon but this monster has a lower ranged Defence. A few safe spots are around. At the entrance to the mine in the north east of Lunar Island, at the fence east of the entrance to the city and at the south east bridge. Monsters you shouldn't range are Metal Dragons. Far too slow, and even when using adamant knives you will need a lot of them to kill one, you can't use your trusty bow and arrows, nor the Crystal: You need the Anti Fire Breath Shield to stay alive. From level 75 you can range most of the Slayer assignments given to you, and it is a good way to do both of them. Elves, Nechryael, Gargoyle, Kurask. Even Basilisk and Cockatrice can be ranged, if you use knives that is. From now on you basically are on your own: You now are among the best 84,000 rangers in the world (at the time of writing this). Reaching 99 will take some time and the only helpful advice we can give: Stick with it, if you get bored, do something else and come back to range when you feel like it. 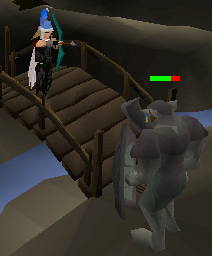 Good luck on your quest to 99 ranged. Once you reach that elusive level 99 Members are eligible to wear the Cape of Achievement. 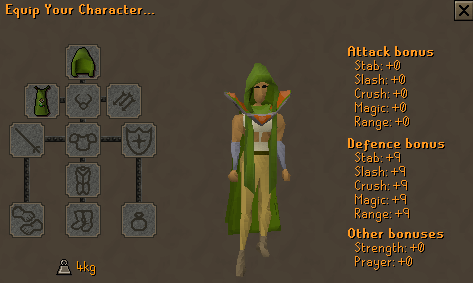 This Cape complete with its Hood can be bought for 99,000 gp at Hemenster Range Guild. The cape gives a boost to all defensive stats of +9. Furthermore it has an "operate option" that will temporarily raise your range level to 100. One other thing: The cape has a specific emote that comes with it. After 80 Range, Red Chinchompas are the fastest way to gain experience up to 99. Every good thing has it's own disadvantage. These things cost a lot. Currently, these things cost up to 1,000gp but they are worth it. When you use these things to attack, they attack all near by creatures in a 3x3 grid. If you do use this technique, you get about 175,000 - 250,000 Ranged experience per hour. This has been tested and proven. Note: Initiate or Proselyte Helm outstrips Archer Helm or Robin if your prayer is below 46. Once on the island, change to the monkey form. Now head west to the Ape Toll Dungeon. Once inside, navigate your way to skeletons (level 142). Once there, turn on Protection From Melee and change to human form. Run underneath the ledge and stand beside any side of the wall. Now start attacking them, and drink potions when needed. Also, walk around underneath to get a better attack range. This way you can attack more skeletons. When you came, there would be 4 skeletons but after a while you can have up to 15! The bones respawn into skeletons. So have fun killing and watch out for floor spikes! After about 30 minutes, the skeletons stop being aggressive. Leave the area and come back again, this will make them more aggressive. After you leave the area, it's a good idea to recharge your Prayer points at the altar on the island. Note: If you are with a Pest Control team, please do not do this. People will get mad at you since people want to get points as fast as possible, and by attacking the creatures you are delaying the game. This is another really good and worthwhile way to train your range. Buy as many red chinchompas as you think you will need. Next, head down to Pest Control. Once there, start attacking monsters. You can attack up to as many monsters as you wish. The best way is to wait about 2 minutes since the game has started. In the top right corner of the game play screen, it will show 18 Minutes. Once it shows that, begin attacking the monsters near the gates. There can be up to five monsters that can be damaged. This is another very effective way to level up your range. Also, remember you also get Commendation Points if you win. These guys are not a bad idea as well. They can be really good ranging experience. Since this is a multi attacking area, you can have up to 10 or even more Dagannoths on you. More Dagannoths on you better it will be. Try to attack the ones that you think will get you the most experience. This is another place where Construction Skill can be really useful. As you may be aware, the combat ring can be used to fight various people. You may invite your friends there or post it on forums as a party at your house. You can ask people to join you in red chinchompa training inside the combat ring! If you can get 20 or more people you will get faster experience compared to training at Ape Toll Dungeon. You will also save prayer and range potions! This is worth a shot! 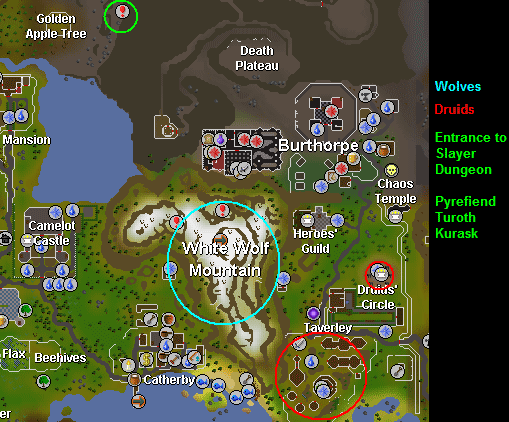 With this method, castle wars should be done in populated worlds (i.e. 2, 6, 9, 12, 18, 22..). Also, when using this method try to stay with the biggest amount of people as possible. Try staying in areas where people will actually fight, like in the small room between the two castles. You may even be attacking over 30 people and this can result in very good experience! Red Chinchompas are worth a lot of money. The price is also rising. When they first came out, they were worth 200gp each. If you really want to use this method, it is suggested that you buy them all first, then use them. This way you will not be paying more than 1k each. The best place to buy them is at the Runescape Forums. 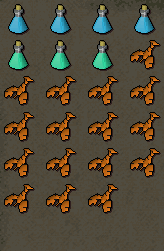 You can hunt these south of Yanille, in the jungle area. You need level 63 hunting to be able to catch chinchompas. Larupia armour is recommended. You can get it from either buying it from different Runescape players or make it yourself. This makes catching them much faster. This way is not suggested. This is because it will take a very long time to catch all the chinchompas you will need. Buy them and use them all up first. Once you have accomplished that, then hunt them. This way you will already have enough range and the prices of chinchompas would have risen. Now you need to hunt less of them than before. This saves a lot of time! Cannon: From 80 range to 99 range, it would require 300k cannonballs. This would cost you 60M (200each). You would use them at lighthouse against Dagannoths (level 74 and 92). You are also using the Crystal bow at the same time and it would cost 65M with all the recharges and cannonballs. Pest Control: In most high level pest control teams, you get about 50 points an hour. If you are using Crystal Bow to increase your zeal (damage), you would receive approximately 100k xp/hour. This means you will need 90 hours to get 99 range. Crystal Bow: Using Crystal Bow on monsters will result in slow experience. An average amount of experience you would receive would be 50k/hour. It would require about 200+ hours to get 99 range. Cannon wins by 3M Cash but loses in time by 19 hours. You can use these 19 hours to make your cash back (at least 3M!). Pest Control wins by 27M Cash, but loses by 45 hours! Crystal bow loses by 180 hours but wins in price by about 10M cash. For 80 range, you get about 125 xp per chinchompa. If you have 95+ range, you may get more than 400 experience per a chinchompa but it is rare. For those in F2p who want to stay a pure with 1 Defence this is not an option: Finishing the quest will raise your Defence level and strength level to 33, just because of the xp reward. So we will simply assume you don't mind, getting your Defence level up to 33, and we will start with Defence level 1. The hard part is getting the 32 Quest Points needed if you are in F2p: Not many quests around and you need to finish close to every one available. Members do have an easier route: Choose whatever quest you like which doesn't add to your Defence or prayer xp, as long as you get to 32 it is ok. 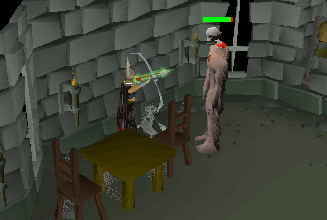 In F2p there are 2 quests that can add to your combat level: Vampire Slayer (4825 attack xp) and Restless Ghost (1125 prayer xp). If you want to avoid these you are left with a possible 33 Quest Points, just one more than the 32 needed. You can drop one 1 qp quest, my advise would be to not start Knights Sword quest. You would meet Ice Giants and Ice Warriors while getting the Blurite ore needed to finish it. However, if you have trouble finding someone to finish Shield of Arrav with you, it is entirely possible to do it. Melzar's Maze, where you need to find a map piece, could be your biggest worry of the whole quest. Do bring food, lobster or better. The keys, needed to go through the next door, are random drops and could take some time. Once you have all the items you need to set off for Crandor prepare to meet Elvarg. 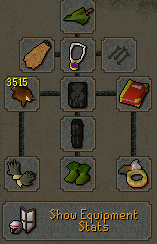 This is what you need: Green D-hide chaps and vambraces, coif, fighting boots (from Security Stronghold), leather body (or better), Anti Fire Breath Shield (from Duke Horatio in Lumbridge), Amulet of Power or Glory, about 200 bolts, crossbow, a full inventory of food (lobster or better) and courage. Get Ned to bring you to Crandor, run past any adversary on the way to the entrance, and go down. Turn run on and enter Elvarg's cage. At the north side is a wall you can hide behind. Run there and stay out of sight. Note: Make sure you have auto-retaliate off! Then right-click Elvarg, attack and run back to your safe-spot. You will get hit doing this, but you will get through it. 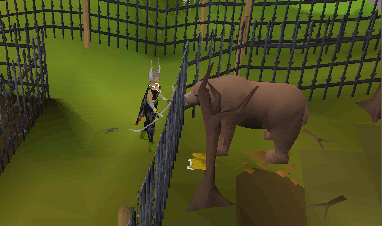 Keep repeating this attack-run tactic until you defeat Elvarg. It might take some time but you will do it. After finishing you will be outside the cage and immediately attacked by skeletons walking about. Run south past the Lesser Demons and push the wall: You just completed Dragon Slayer as a ranger. Finishing will give you 33 strength and Defence, with a combat level of 35. 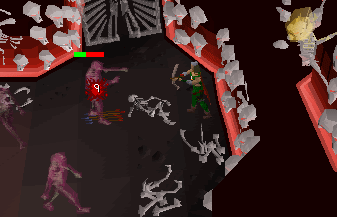 If you don't want this to happen, but do want to access Crandor, this is what you do: Do not enter Elvarg's cage, but run straight past the Lesser Demons and push the wall. Your character will remember this, and you can now use this doorway to go to Crandor from Karamja volcano. The highest available Shortbow, the Magic Short, and the Yew Short can only be bought from players, fletched or as a reward from a level 2 or 3 Clue Scroll. For the Magic Short bow: If bought prices range from 4000 to 5000 gp. When bought in bulk prices hover around 1200 gp. All Leather armor: Al Kharid General Store, Lumbridge General Store. All types of Dragon Hide armor available from players or crafted. All types can be a reward from various Treasure Trails. As a Member you have access to a large collection of range equipment. With regards to leveling fast four of them stand out and will be explained here. Through the Herblore skill it is possible to make a Ranging Potion. This will temporarily increase your ranged level by 15%, Herblore level needed to make it is 72. Otherwise buy from other players for around 5000 coins. If you can afford it (or make it), use it as it will result in a larger amount of exp per hour ranged. From level 40 and up Knives are a very good alternative to the most commonly used Iron arrow. Particularly the Iron variety has the best overall performance. Though these only give a +5 range bonus when wielded, they outstrip the steel (+8) and mithril (+11) variety in effectiveness. Knives are thrown very fast and, though they hit less than an iron arrow, the exp is impressive and faster than iron arrows. Knives can either be made or bought. One place to buy them is in Rogues Den from Martin Twait. However, he will not trade you unless you have 50 Thieving AND 50 Agility. As an alternative you can buy them from players for around 40 coins each. To make them smith an iron bar into 5 knives. The alternative to knives are darts: They hit less than knives and wear out faster, but do give fletching exp when making them. After finishing the Dwarf Cannon Quest you have the ability to buy and use the Dwarf Cannon, the highest hitting range weapon in RS (max hit 300 Life Points). A Cannon can be set up almost everywhere, and once loaded with 30 cannon balls it will fire at any opponent in range. For the warrior it is a very effective way to level range while, at the same time, training melee stats. Set up the cannon in a Multi Combat area, load with 30 cannon balls and click fire. The cannon now starts revolving, hitting everything in sight. The monsters you are fighting will line up and attack you, while the cannon will attack them until it runs out of ammunition. On average, per cannon ball shot, you will gain approximately 20xp. The biggest drawback of the cannon is the price of the ammunition: Around 200 each cannonball (or make them from a steel bar, 4 cannon balls per bar). The exp gained is not 4 times the hit count, but only 2 times: Hit 300 Life Points and you will gain 60xp. One big disadvantage of the cannon when using it at low levels: As with every piece of range equipment your range level and your range bonus affects the height of the hit as well as the number of misses. 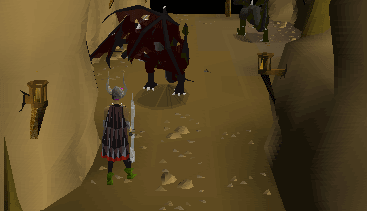 Monsters extremely suited for this type of training: Dagannoth under the Lighthouse and Kalphite Soldiers in the Kalphite Lair. 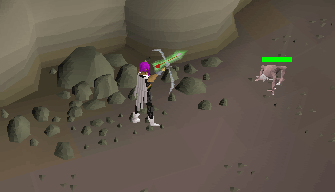 The Crystal Bow becomes available after finishing Roving Elves Quest. It needs 70 ranged and 50 Agility to wield. Though expensive at the start, the re-charge price drops to 180k. For this 180k you will get 2500 shots, so it will average 72 coins per shot fired. The range bonus of the bow, 100 when new or re-charged, drops with 4 every 250 shots fired. Thus the range bonus is higher than the Magic Shortbow for 80% of its life. Though slower than the Mage Short, it is a very effective training weapon with a max hit of 230 on accurate setting (at range 99, unpotted). To give an indication what is possible with a Crystal Bow: With one full bow, at level 99 range, you can kill around 160 Blue Dragons. With just the dragon hide you can pay for 2 charges of the bow. The bones and clue scrolls are your profit. 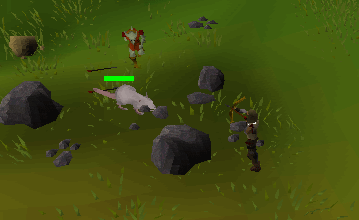 If you just look at exp: That same full Crystal Bow will kill about 190 Bloodveld (99 range) and they do have 120 hp which means close to 90k exp per bow. When using this weapon DO NOT use the rapid setting. This is the only ranged weapon where the speedier delivery of the arrows does not counteract the loss in max hit. At Blue Dragons the Crystal Bow at 99 range can kill 160 maximum that would mean a price per kill of around 1125 gp. Rune arrows when bought in bulk cost around 400 each. 800 rune arrows, picking them up after the kill, will kill about 250 Blue Dragons or 1280 gp per kill. The speed of the kill is with the Crystal slightly faster. 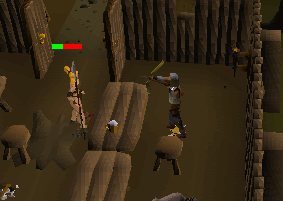 Thus training at 99 range is less costly using the Crystal Bow. I cannot comment on levels lower than 99 but it would be wise to do the comparison yourself as the exp gain with the Crystal Bow from level 75 and up is faster than with rune arrows. The latest addition to the weapons the ranger can wield is a family of Crossbows. All of them are player made and start at Bronze to end at the Rune variety. The bow consists of three different parts: A Stock, made of logs from normal up to yew. Limbs, starting at Bronze and ending at Runite and a new string: spun Sinew (use beef on a range, then spin on a spinning wheel). The bolts used come in a staggering variety: Eight different metals are used, two of them until now un-used as weapons material: Blurite and Silver. All bolts (10 per metal bar) are fletched using 1 feather per bolt. Once done they can be used. But they can be improved upon. Starting at Opal and ending at Onyx all gems can be cut to make Bolt Tips. Various Tips need Bolts of a different metal. 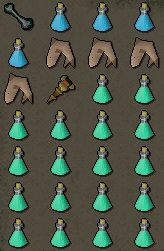 Probably Mithril Bolts tipped with Emerald Bolt Tips, will be the most used. But that still is not the end of the possibilities: All bolts can be enchanted. On Emerald tipped bolts it works the same way as weapon poison. Ranging with the Rune Crossbow (+50 range attack bonus) is slow, very slow. 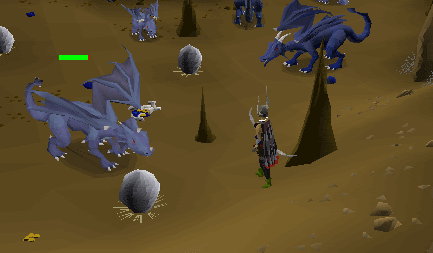 At 99 ranged with Emerald tipped Bolts it is impossible to kill a Blue Dragon without the bolts becoming visible for fellow players. Using the Emerald tipped Enchanted Bolts for training purpose is not very good as poison hits do not count toward range exp. The maximum hit is not bad at about 230 but it takes a staggering 3.5 seconds for the next Bolt to leave the weapon. At 99 range and with this ammunition it is impossible to gain more than 17-18k exp per hour. Changing up to a higher bolt helps. With Adamant Diamond tipped Bolts the hit rate goes up, but the maximum hit stays at 190. Using Diamond Bolts (e) is preferable as it has a chance to lower the opponents ranged Defence. Despite this it is not a very good bow to use when training. Though it is a fast way to level I would advise against it, if you are building an all-round character: Use the points on Prayer instead as this is far harder to level than it is to level Range. 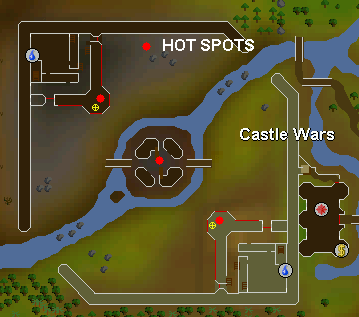 Though it can be fun to play, Castle Wars isn't a very fast way to level range. It is however, a very good way to relieve you of the boredom, that will surely set in at some time: Ranging can be boring when trying to level. If you do choose your target wisely: Mages are a nice way to collect hits and your armor is well suited against their spells. Stay on the walls of your Castle and hit them from a distance. Karil's X-bow and the Crystal Bow are the weapons of choice, as you won't have to run after your arrows. The Fight Caves is a game eminently suited to show your range capabilities: As if it was designed with the ranger in mind. It does give a decent amount of exp, and at the end there is the elusive Fire Cape as reward. 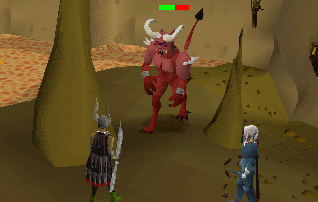 From level 75 range you stand a chance to get all the way to TzTok-Jad, use prayer potions, range potions and food wisely. Be sure to take a look at the guide before you start. 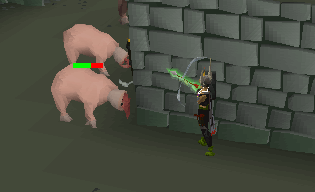 The monsters in RS have one peculiar habit. They move along the west-east axis before moving along the north-south axis. This can help you a lot when you are ranging (or mageing). When you are facing north, with an obstacle in front of you, your prey will get trapped on the square to your north-west. When you are facing south, again with an obstacle in front of you, he will stand on the square to your south-west. 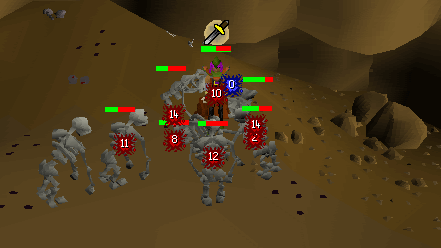 Range is an extremely effective way to level Slayer. Close to every assignment can be ranged. What is more: All Slayer monsters have an above average number of Life Points, thus making your task of leveling range a bit easier. Also Slayer monsters do have above average drops, so it is well worth your while to practice on them. 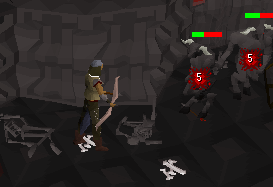 Notably good targets: Bloodveld, Nechrayel, (both can be found in the Slayer Tower) Pyrefiend, Kurask and Turoth (all three at the Slayer Dungeon, the last two both need Broad Arrows to kill). Ranging Fire Giants in the 'melee room' at Waterfall Dungeon has one big advantage over the western room. There are simply more Giants there: 7 in all. When you enter that room, turn run on and run to the far end of the room, then back to the eastern door again. 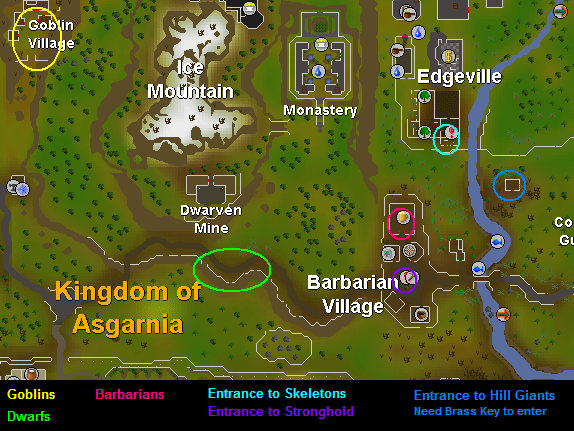 The spot in front of the eastern door is your safe spot until the Giants won't attack you. The reason for the dash to the back of the room is very simple too: When you do that, the Giants behind the table will stop being aggressive at the same time as the ones south of the table. If you don't do that your wait will be twice as long. For those with a combat level below 86: Bring mind and air runes to cast an air strike as first attack: You will be at least as fast as higher leveled players and warriors will hate you for it. When you are making a range pure or a range/mage hybrid, you will have a combat level of 25 when reaching level 38 range. Be sure to take mind and air runes with you when ranging creatures above your combat level. This allows you to very fast attack a monster with a high combat level: Open your Spell Book and click on Air strike. When your target spawns all you have to do is left-click it, then right click to attack with range. Use common sense to figure out what monsters to range: Chain mails have holes and thus are weak to ranged attacks, full armor is very good against ranged attacks. So by all means have a go at Guards, but stay away from Paladins, Hero's and the like. 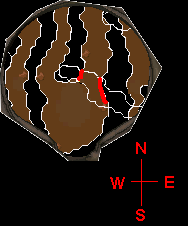 Contrary to what most people think: Scorpions aren't good range targets, neither are the Snails in Mort Myre Swamps or even Rock Crabs below level 20 range: They have a skin like armor. 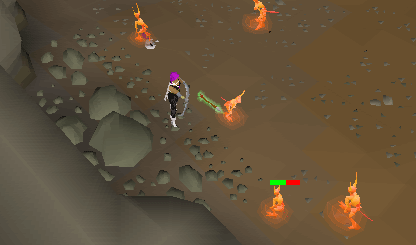 When training in remote areas be sure to take a Fire Staff and some Nature Runes with you, as it can be a pain to have to bank every now and then. To make the most of your time training, pick up only those items that alch for more than a Nature rune is worth. When ranging the Giant or Dragon race, you will get a lot of big or dragon bones. You can do 1 of 3 things with them: Leave them, pick them up and bank them or pick them up and bury them. To bury a full inventory of bones will take 37 seconds away from your ranging time but it might be the way to go as Prayer is a hard skill to level. Be sure to find a safe spot inside the area of attack of your intended prey. If you don't your prey will start wandering about, which will make it harder to pick up your arrows, as they are scattered all over. One of the areas this happens frequently is at the Blue Dragons in Taverley Dungeon. Should you be able to stand the boredom of leveling all the way from level 20 range to 99 and stay at one or two monsters, couldn't care less about drops and if you are a Member, then there are two alternatives that hardly can be beaten in exp gain: Experiments and Rock Crabs. Often crowded but arrow for arrow the fastest way in RS, for Experiments you need to have started Creature of Fenkenstrain.